Baroque Orange was originally opened on October 22, 2002, making this site well over 14 years old as of this writing. When it was created, much of the Fruits Basket manga had not been published yet so there was a lot of missing information on this site for a very long time. For years, I had wanted to come back and update the site with all of the new information that had come from the manga's completion but I never really had the opportunity. Finally, in February 2016, I was able to find the motivation to re-read the series and update all of the information here. It was a very huge project as most of the sections on the site have been fully re-written. It was a fun process though, and I'm happy to present the new version to everyone! 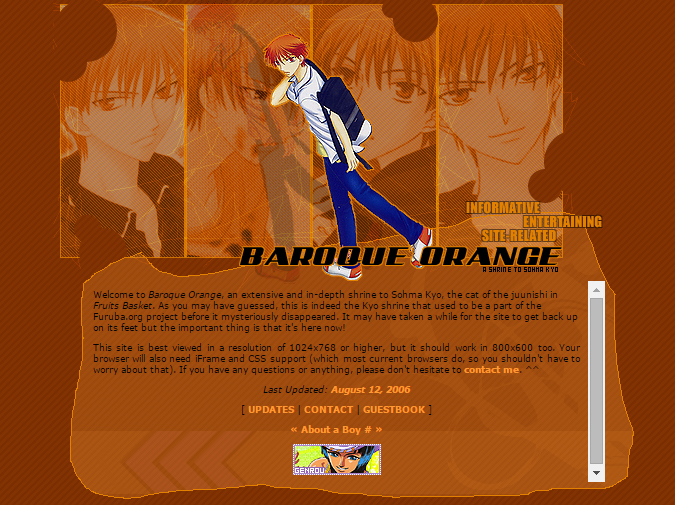 For a little bit of backstory, Baroque Orange was originally hosted on the now defunct Furuba.org. I was approached by a girl who wanted to create a Fruits Basket-centric domain containing a character site for each of the main characters in the series, among other miscellaneous things. I thought it sounded like a great idea since I was the founder of a similar project for Slayers so I agreed. Furuba.org had a "one site per character" rule so I was happy to take on the position of being the resident Kyo shrine. Sadly, Furuba.org went down about a year later in April 2003. The girl who owned it transferred it to another person who, shortly after receiving ownership, decided to delete all of her sites and leave the online community altogether. The domain was up in limbo and expired and I was unable to get my files off the server before they were lost to me. So Baroque Orange went offline for several months while I attempted to use the Wayback Machine to retrieve the information I had lost but not all of the images, wallpapers and icons. Those were lost for good. It took a lot of hard work to get the site back up online, especially since all of the hard work I had put into it initially was lost to me. It wasn't until May 2004 -- almost a full year after it was lost -- that I was able to bring the site back to life. I had found the motivation I needed to recreate everything that was lost to me. This time the site would be added to my own domain so that a repeat of the Furuba.org disaster wouldn't happen.